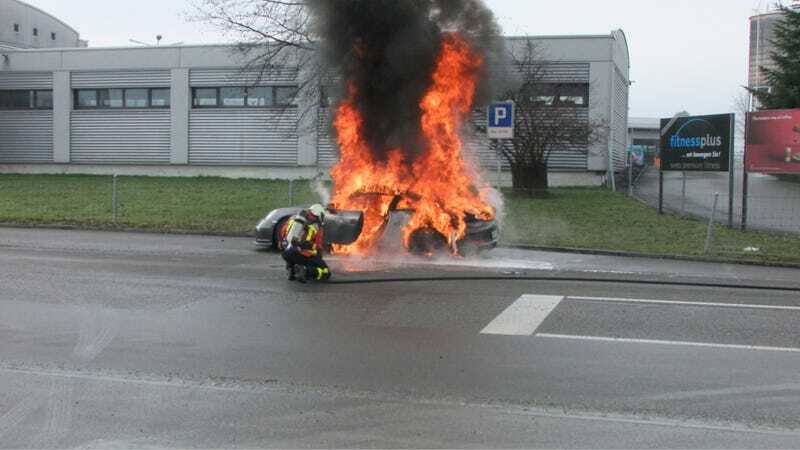 Porsche has reportedly halted sales of the 2014 911 GT3 after a person driving one noticed an unusual noise, and then some smoke, and then some flame, and then his car completely destroying itself in Switzerland, according to the local cops. That's not what we in the business call a Good Thing. The German company has yet to confirm the stop-sale order, and no official recalls have yet been filed with the US government, but if this is indeed the situation you probably should not be pushing your GT3 to the limit right now, just in case. You might want to call a Porsche dealer or something first, before you, you know, depart this earth in a fiery blaze of glory. Maybe. Have a brand new Porsche 911 GT3? Is it currently on fire, or has it already burned to a crisp? Let us know in the comments. H/t to TopSpeed.com and Porscheboost!